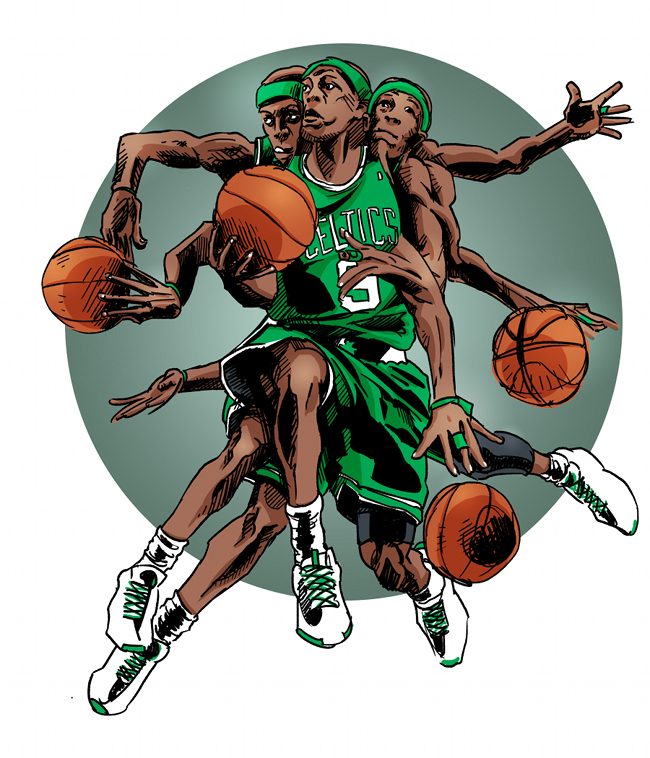 Rajon Rondo: as strange as he wants to be. Original art by Eli Neugeboren. 1. Before training camp even began, Rajon Rondo found himself in the middle of Chris Paul-related speculation. He pledged to be nicer to reporters. 3. According to Basketball Reference’s similarity scores, Rondo’s closest statistical match is Dan Majerle. Earl Monroe is also on his list, as are Walter Davis and Bill Sharman. Doc Rivers says he never looks at Rondo’s numbers. 4. Kevin Pelton, resident dean of Basketball Prospectus, suggested Gary Payton as a comparison. Sonny Hill, the great godfather of Philly hoops, agreed. Rondo nodded. “The Glove, right?” You remember watching him? “Not really.” Payton retired in 2007, his first year in the league. 5. “Some people try to mimic their games after certain players, but I never really did…” Rondo didn’t get serious about hoops until his senior year at Oak Hill, when he figured that if Josh Smith was an NBA prospect, then he could be one, too. 6. His signature move of the summer was throwing an alley-oop to Rudy Gay off his own forehead. His signature had been wearing a headband with the NBA logo turned upside down. He stopped wearing it after being informed that it didn’t comply with the uniform code. He brought it back, this time with the logo turned around backwards, and dropped 20-17-18, then chucked it. 8. He pulled up a chair and sat with his back to us, watching intently as two rookies, a journeyman, and an assistant coach played two on two during practice. Something disappointed him and he rolled his head through the kinks in his neck, which cracked loudly. He was gone a few seconds later. 9. In the locker room, you wait for Rondo to engage you. PF: Why did you do that? RR: To see if you’d believe me. PF: So now you think I’m gullible. RR: I fooled you twice. I’m playing tonight. He returned to the lineup a week later. 10. Tubby Smith wouldn’t comment for this story. John Calipari let him use the gym during the lockout. 12. The bottle flew across the room and shattered, ending the film session. His elbow exploded a few days later, but he played with one arm anyway. 13. “He’s the smartest player I’ve ever coached.” Report: Rondo, Rivers at odds. 14. A man was arrested after allegedly throwing a punch at Rondo following an appearance in Lowell. Some say Rondo was quiet and reserved. One witness said he was rude. 15. Lowell is to Boston as Allentown is to Philadelphia. Rondo’s jersey is the only one seen with any regularity in Cambridge. 16. Mike D’Antoni wanted to know what would happen if Rondo played in Minnesota. Mike D’Antoni could have coached Rondo, but his team took the cash instead. Minnesota wanted to know what would happen if Rondo played in Minnesota, but Danny Ainge held firm and offered Sebastian Telfair. 17. His trade value has never been higher. Everyone is afraid to put him on their team. Kobe loves him. 18. He’s growing up, but he’s 26, a father and no longer a kid. He’s not a follower, but he’s not yet a leader. He’s not a franchise player, but he’s irreplaceable. Paul Flannery covers the NBA for SB Nation and teaches journalism at Boston University. He tweets @Pflanns. A cultural shift that spread to soccer once foreign flair began to flood the academies. Minnesota wanted to know what would happen if Rondo played in Minnesota, but Danny Ainge held firm and offered Sebastian Telfair. Blue Paisley Fine Rugs is Toronto’s newest premier provider of luxurious high quality rugs offering the widest selection in size, colour and services. We believe that every fine rug tells a story and manifests a tradition; it is an investment for generations to come and selecting one should be a tailored fulfilling experience. Our family works closely with our clients and suppliers to ensure that every selection leads to satisfaction for decades. know what would happen if Rondo played in Minnesota, but Danny Ainge held firm and offered Sebastian Telfair.